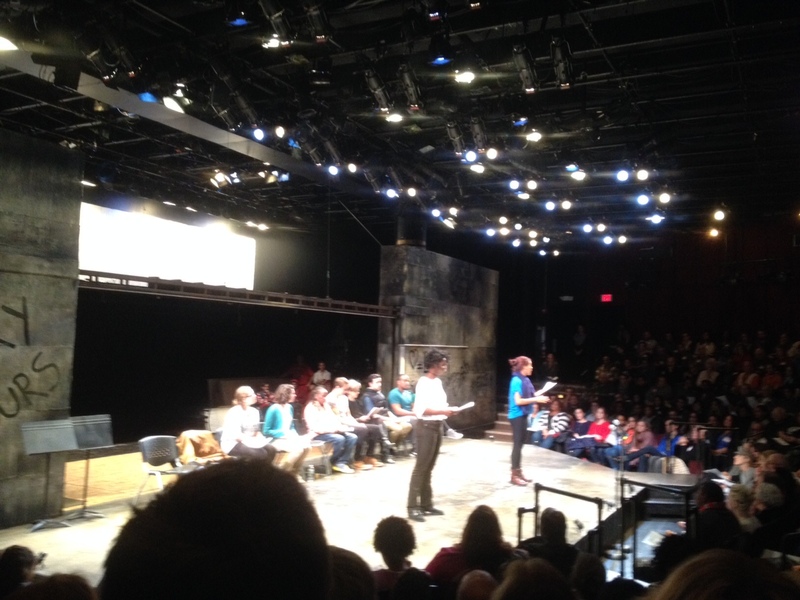 I witnessed a historic theatrical event Monday night–the world premiere of the One-Minute Play Festival’s Every 28 Hours at Trinity Repertory Company here in Providence. The One-Minute Play Festival is a theater company out of New York City that produces one-minute plays which aim to tell a neighborhood’s story through community engagement. Every 28 Hours is the current festival theme, and is based on the events surrounding the killing of Michael Brown, a black teenager, by a white police officer in the summer of 2014 in the St. Louis suburb of Ferguson, Missouri. Every 28 Hours stands for the supposed statistic that every 28 hours, an unarmed black man is killed by a police officer. The anticipation of the packed audience, young and old, black, white, and brown, in the intimate Dowling Theater at Trinity Rep was in the air, as the Extraordinary Rendition Band–a street band open to all,with a mission to bring attention to selected causes, paraded onto the stage–drums, brass and percussion, and rag-tag red outfits in full glory. After a softly sung We Shall Overcome, a young woman from the band spoke while the band continued to play. She spoke of the injustices that this audience seemed sadly all too well aware of–the killings of far too many young, unarmed, black men and women, mostly at the hands of police officers. After the band finished, Joe Wilson, Jr., actor and playwright with Trinity Rep, stepped onstage. Mr. Wilson shared with us, that despite the hateful comments that appeared on social media regarding the announcement of the local Every 28 Hours performance, the show was being held, and that this very action “is how we move things forward, with art and love, and theater.” We learned that Wilson was a part of a group of actors and playwrights from around the country who visited Ferguson, Missouri last week to meet with the One-Minute Play Festival group, learn the methodology of going out into the community to gather stories, create plays and then take the plays back to their own communities. Yet, Trinity Rep is the only theater doing the show this week, while most other groups will premiere the Every 28 Hours One-Minute Play Festival some time next year. Wilson further explained how he and the other artists met with community leaders, residents, the faith community, and the school that Michael Brown attended to learn about how the events of Ferguson have impacted individuals, and their community. There were many interviews culled, but Wilson noted that the interviewers were not allowed to take notes, but to connect more intimately through conversation. Conducting the interview in pairs, Wilson said, allowed one artist to catch something said, or a certain mannerism that the other might have missed. Writing solely from inspiration derived from these connections, the artists gathered to write their plays–all of this taking place in one short week. Wilson’s passion shined brightly as he spoke, and he became emotional when he dedicated this show’s performance to Dr. Barbara Meek, a long-time company member of Trinity Rep, a woman Wilson said taught him how to be inquisitive, and whom he loved dearly. As we braced ourselves for the eighty, one-minute plays that we were about to witness–plays written by playwrights and actors from near and far, and acted by scores of actors, as well as students from all over the city–Wilson asked us to consider “every minute as a heartbeat, a snapshot of the world..” and that with each snapshot, we hear a different story, and get a more inclusive, better picture of the world we live in. And with that, the festival sprang into action, with nine sets of seven or eight plays each. With each set, a group of between six and a dozen or so actors of all ages and races stepped onto the stage and sat in a row of seats set across it. They’d rise when it was their turn, while the other actors remained seated. At times white actors took on the role of a black character and vice versa, women played men’s roles, and it all worked. The most extraordinary thing to me was that Wilson explained to us that all of these actors had arrived at the theater at 5:30 that evening, and had only one hour to see their scripts, and rehearse. The play themes were directly linked to the Ferguson incident, the Black Lives Matter movement, and the larger social issues of racism, white privilege, policing, and the invalidation of black people’s feelings about the inequities they face. Each play magnified snapshots of the world that Mr. Wilson spoke of in his introduction to Every 28 Hours, and reflected back to us our humanity, in all its ugliness, and flawed, beauty. There were many powerful, sad, uncomfortable, emotional moments, and they came at the audience rapid-fire, so much so, that my head, and my heart, spun, working hard to process all that I was bearing witness to. There was the exchange between a man and a woman who says she’s leaving town to pursue acting and voice-over jobs. He teases her, asking her to do the voice of a cat, and other obvious noises, and then stings with the challenge, “what is a white person’s voice when they see a black man lying dead in the street?” Silence. My friend, Ellen, who also attended, shared with me her feelings about the final play, which for me was also one of the many moving moments. She expresses what I had a hard time putting into words, perhaps it too profoundly sad for me to wrap any words around, and so I thank Ellen for doing it so well for me. Restless, overwhelmed, angry, and heartbroken, I felt like the white woman in the one play that spoke to the way we frame “those kind of neighborhoods” where all the bad stuff happens. The play featured a three-way call between two black women and one white woman, a blend of gossip over the Mike Brown shooting, one-upping one another about the places they live in “changing your zip code doesn’t change the color of your skin!”, and finishing with one of the black woman intentionally slipping and saying, “I guess you’re white” instead of “right,” exasperated by her friend’s perspective of the incident through the lens of white privilege. My white moment was when I caught myself longing for at least one of the plays to show a glimmer of hope. I’m a Pollyanna by nature, but was able to realize that these were the stories that were being heard and gathered in Ferguson and there was no clean, tidy, rainbow ending, at least not yet. But hope did come. It came wrapped up in the closing performance by one of the young black male actors, who took the stage with an acoustic guitar and sang, Wake Up Everybody. As he sang, Joe Wilson, Jr. called in all the actors who had just performed, to wrap around the stage and along the aisles. It was a beautiful moment, uniting all of us there in that space, holding us, calling us to action, and as Mr. Wilson said, showing us how love and art can move us forward, together, one heartbeat at a time. In the Talk Back that followed the show, Mr. Wilson shared more about the process of connecting with the people of Ferguson, and the methodology of the One-Minute Play Festival, as well as his observations of how systemic racism–redlining, and how the land mass in the Midwest affords an even greater opportunity to isolate communities of color–via the way highways are designed, the lack of public transportation, the “donut ring” of housing where black people are designated to one area of the ring, with rings of suburbs surrounding them that are white neighborhoods built on covenants that kept black people out. He spoke of Normandy High School, the school Michael Brown attended, and how it had lost its accreditation several years ago, and how students there because of this, were allowed to go to one of the “donut” schools in the white neighborhood, but because there had been such inequities in education, many of the students from Normandy couldn’t make it, or felt so unwelcome, that they returned to Normandy. I could sense Mr. Wilson’s dismay as he spoke about the systemic racism, and the subjegation of the people of Ferguson, who were and continue to be cut off from opportunities to accumulate wealth, and equality on so many levels. Yet, I also sensed his passion for the Every 28 Hours project, and the pride that Trinity Rep was the first to premiere it. I was unable to stay for the entirety of the Talk Back, but this night will stay with me forever. I am grateful to have been a witness to this premiere event in our very own city, and look forward to all the good it will do, all the conversations it will start, and the calls to action it will provoke, and the human connection it will encourage, as it shows around the country. Wendy, this is a great post. You really captured the feeling of it. It was a very intimate evening, especially, as you say, when the young man sang the song at the end. I felt like I was sitting in a big living room with friends. Like you, I’m very Pollyanna-ish, and I too hope for a happy ending to this. I know that won’t happen — at least not that easily — but for what it’s worth, it does seem like there have been far fewer incidents like Ferguson, et al., in the news recently (with the exception of the horrible thing that just occurred in the classroom with the young female student). I hope it’s a trend, a sign of dialogue taking effect and of better days to come, a new understanding. It is so unfortunate, though, that things often have to reach a tragic level for change to happen. This play festival, at Trinity and at (hopefully) theaters around the country, will at least get people talking, as you say. That’s always a good place to start. And you’re contributing to the dialogue by writing about these things here — keep it up! Thanks so much for reading and for your feedback. I was glad to share the evening with you. I’m not sure though that there have been far fewer incidents–there’s been Sandra Bland, Walter Scott, the teens at the pool party, lots of viral videos showing excessive force by the police on young people of color vs. videos of leniency when it comes to white people who are confrontational with the police, but I do think there is this real building of awareness and tension, like we are at this tipping point, and so I think that gives me hope that people are going to continue to raise their voices and fight for real change. Thanks again, my friend, for your support and thoughtfulness. Beautifully written and deeply moving blog, Wendy. I was sorry to miss this (hope to catch it elsewhere) but your blog conveyed a sense of the depth of the night–its value, need, sorrow and beauty. Thanks. Thank you so much, Diana. One often feels like how can words even convey the feelings and experience, so I am glad that you felt you got a sense of the power of Every 28 Hours. I am pretty sure that Trinity will be doing it again when there is a nationwide event for it. I definitely would see it again. Thanks again for reading, and for your support. Hello, there, my For Always so, so very sweet Jewish and white sisterfriend who you are so, so very much, Wendy Jane!!!!!! Wow, writing to you and your great blog right now is such a blessing-I sometimes have sleeping issues like with trouble sleeping and having the great joy of writing to you, sister, and your so very cool blog keep my mind off of my aggravation at not being able to sleep!!!!!!! Wendy Jane, wow, wow, wow and a zillion wows, sister!!!!!! This blog post article of yours is absolutely so very beautiful and lovingly heartfelt in such a caring, sensitive manner. I so love and cherish how so hard you worked on this in such a very detailed, descriptive, and so delightfully thorough manner. I so love and like to, sister, how you very graciously and generously provided for all of us this great video clip. My so very dear friend, I would love to see this absolutely fantastic performance here where I live-it would be an absolutely amazing and glorious experience, Wendy Jane!!!!! I love all of the great and profound comments from all of you above. I am so very impressed that some of the performers learned their scripts right at the last minute-this is very impressive and I can tell that they did such a great job, Wendy Jane!!!!!! I love how a variety of people white and black and other people of color acted out the scripts! This is very deep and I can tell how effective this was for sure, Wendy Jane!!!!!! I love the great and sincere dedication of Joe Wilson, and how he was empowered and emboldened by the late Dr. Barbara Meek. I love so and like so, so very much the great dedication, and very diligent and conscientious work of everyone involved!!!!! Wow, I just can tell from you, sister, and the friends above who commented just how Spirit-filled a full of soul this performance was for certain, Wendy Jane!!!!!! I am a Pollyanna, too, with my For Always eternal positive optimism in keeping my very faith and hope alive For Always!!!!!! Sometimes I have had trouble with some other black people and within the black communities because they don’t appreciate my being a positive optimist and such a Pollyanna, and it can irritate some folks, sister!!!!!!! I have such faith and hope that things can very much get better, and I have such complete confidence in you, my so, so very precious white friend and sister, Wendy Jane, and in other white persons that each and every one of you can learn, heal, and grow!!!!!! I’ll never ever give up on you, sister, and on other white persons, and I’ll For Always so, so very much love and cherish you, Wendy Jane, and other white persons, very, very especially you and other white women being my very heart as the very liberal, open-minded, progressive lesbian black woman who I am for each and every one of you are our Dearest and Darling God’s children and my sisters and brothers!!!!!!! Sister, I think it is perfectly understandable when you had what your referred to as a white moment. I so, so very much understand!!!!! I have that same kind of everlasting positive optimism as well even as a lesbian black woman, sisterfriend!!!!! I love Ellen’s very Spirit-filled and deep reflections here, and everything in this amazingly fantabulous blog post article of yours, Wendy Jane!!!!!! Sister, please have a very fun-filled and fantastic Friday, a wondrously wonderful weekend, and a spectacular week coming next week!!!!!! You are my very joy and blessing, Wendy Jane, and writing to you and your blog so very joyfully, and joyously responding with my very heart in my heartfelt comments is my very joy and blessing, Wendy Jane!!!!!! Thank-you!!!!! !